Amanda Somerville is an American singer-songwriter best known for her collaborations with various European metal bands such as Avantasia, Epica, Kamelot, and After Forever. Since the late 90’s Amanda has worked mainly in Germany and the Netherlands. With a vocal range from tenor to soprano and stylistically diverse, Amanda s solo career has mostly comprised of pop/soft rock and hard rock but has experience over a wide selection of musical influences. In 2011 Amanda became the lead vocalist of the band Trillium who released their debut 'Alloy'. 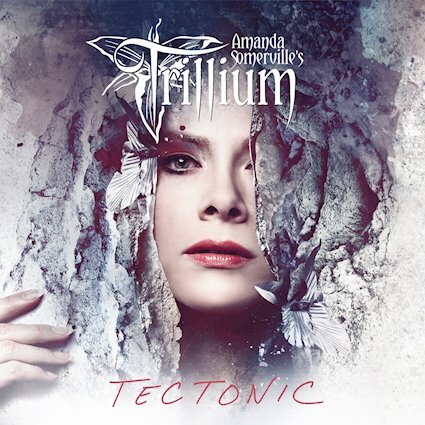 After a seven year gap Amanda is ready to grace us with Trillium’s sophomore album 'Tectonic'. 'Tectonic' is a worthy follow up to 2011’s 'Alloy' and it’s a very good album. In my opinion there isn’t actually a weak track on this album in fact the majority of the compositions are sublime. Vocally Amanda has a phenomenal range and it doesn’t matter whether she’s singing gentle ballads, belting out hard rock or soaring opera she changes between styles flawlessly. Instrumentally the band are on top form, symphonic keyboards, thunderous percussion and riffs that will make your toes curl with pleasure and when you put them all together you will experience multiple eargasms. However despite all that praise there is a BUT and I think the majority of people will know what that is, whilst 'Tectonic' is an excellent album it’s nothing new there are simply far too many bands out there that sound the same. Trillium may not be breaking any boundaries but they are making excellent music and are keeping good company with bands such as Nightwish, Epica, Leaves Eyes, Within Temptation and Delain.